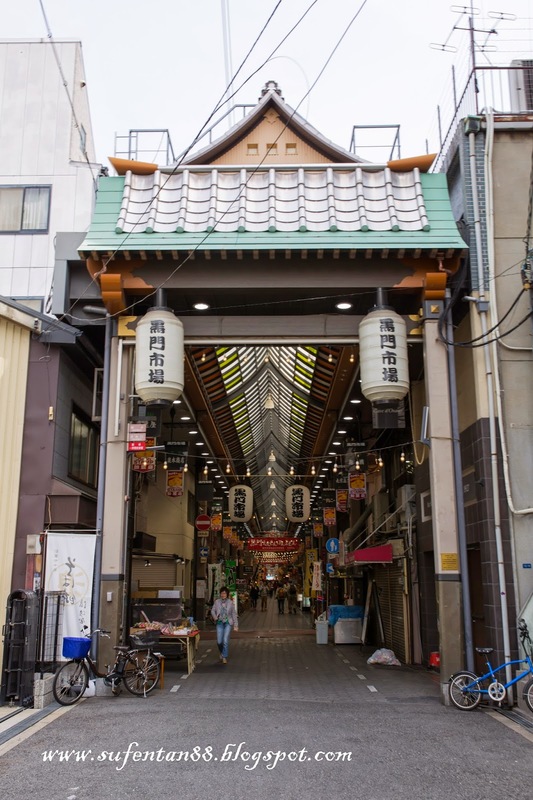 Kuromon Market is one of the famous morning market that must visit when you are in Osaka. 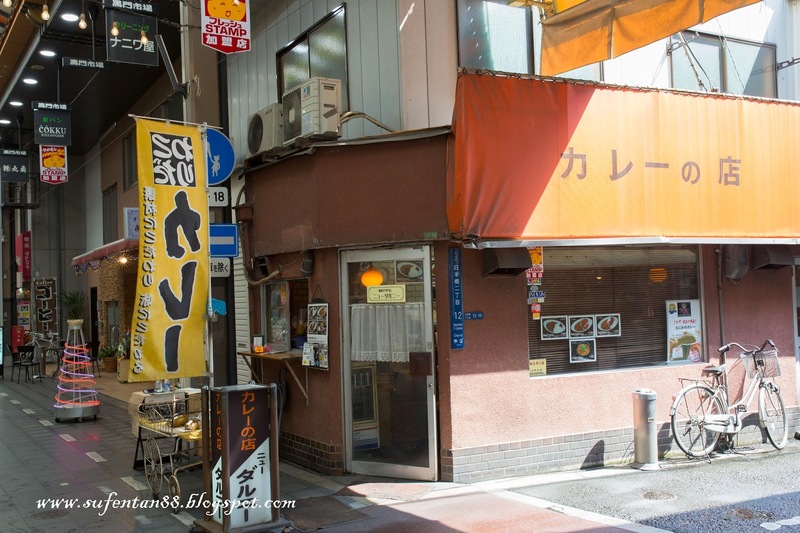 It is just few mins walking distance from Namba station. There are more than 100 stalls, from selling fruits, fresh fish, seafood, meat, clothes, tea to food outlets and etc. We actually had our breakfast here most of the morning when we are in Osaka. 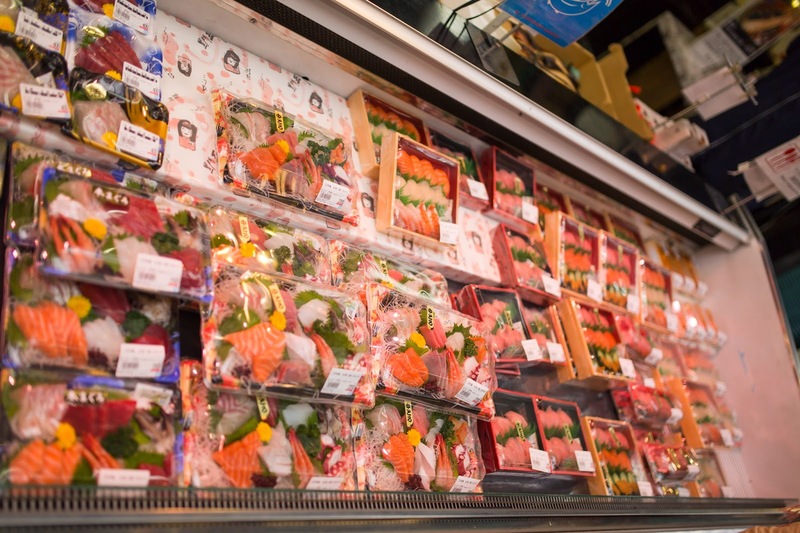 They also served fresh sashimi in reasonable price where you can eat on the spot(seating area are available there). Here is the latest guide map. 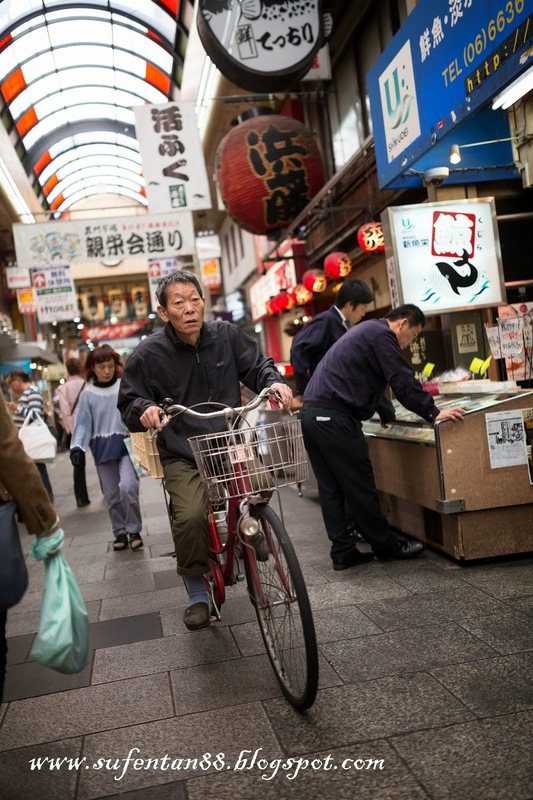 Managed to capture this scene when the old man cycle in the market. We actually tried out a few of the food stall. Let's see what have I discover! 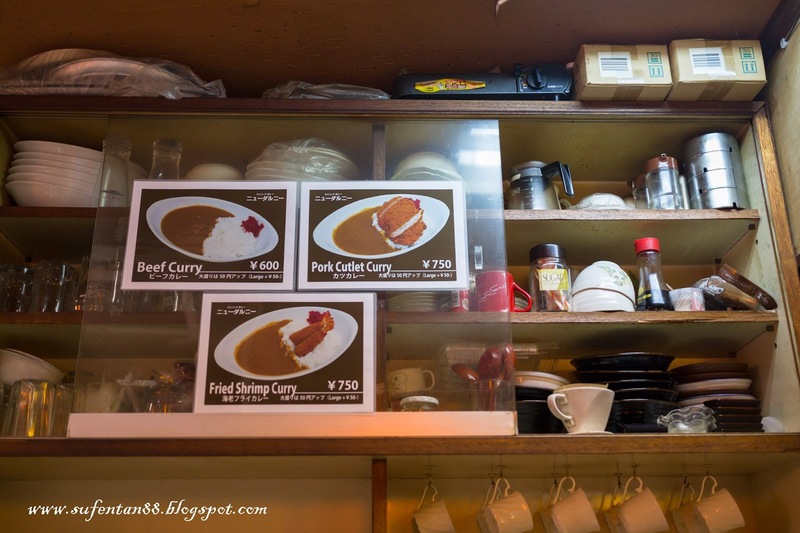 This is one of the famous curry restaurant in town, a small shop at the end of the road. Basically, it can only accommodate around 10 pax. 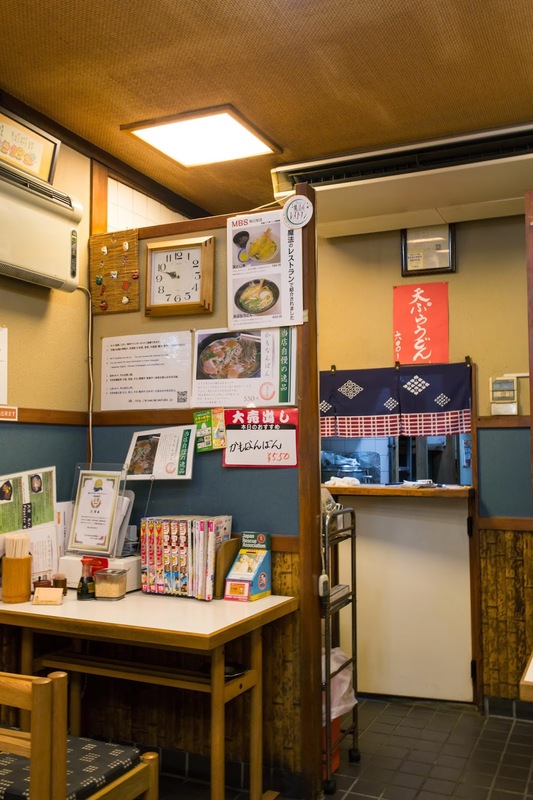 This little shop is solely operate by the owner himself, he cook, take order and serve. 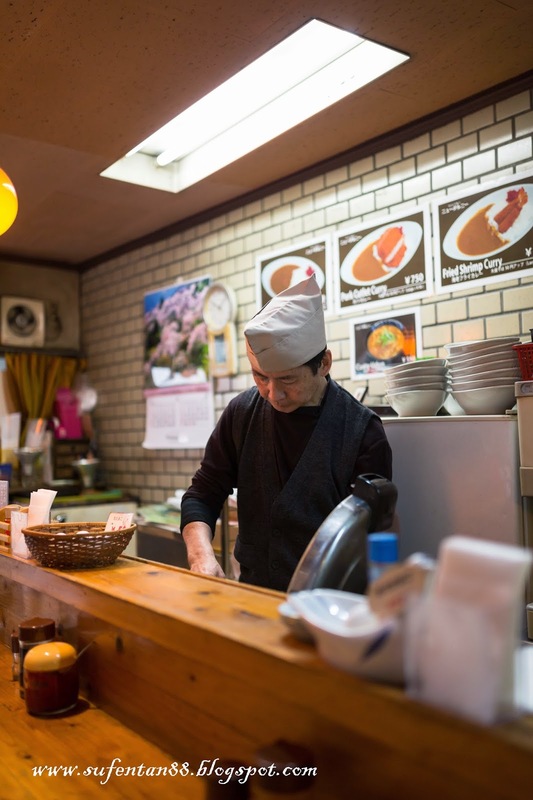 He also sell fresh packed curry outside his shop where the local will buy back to cook. Counter based seating where you can see the owner cooking from your seating area. This shop only served curry which only comes with 4 items in the menu. Three types of curry rice(beef, pork and shrimp) and curry udon. 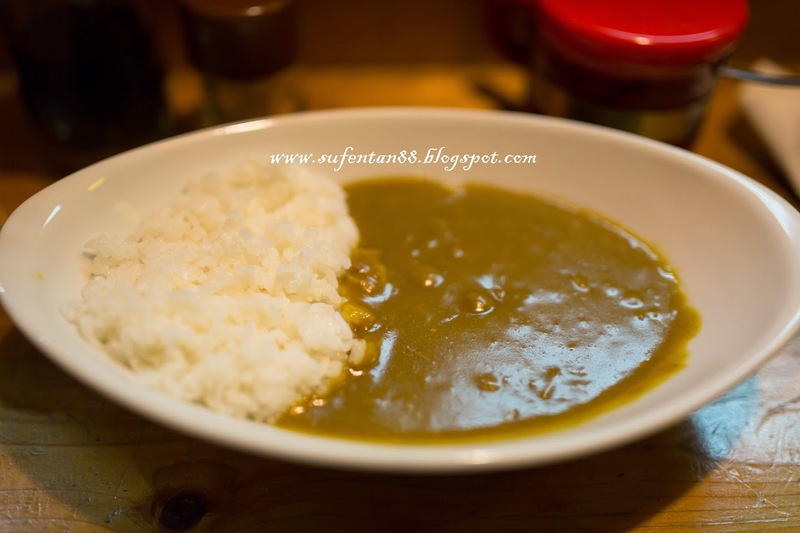 We really felt in love with the curry, it taste so nice and so different from the normal Japanese curry we had in Malaysia. You can smell the curry from far, although the food presentation is simple but it taste super delicious. 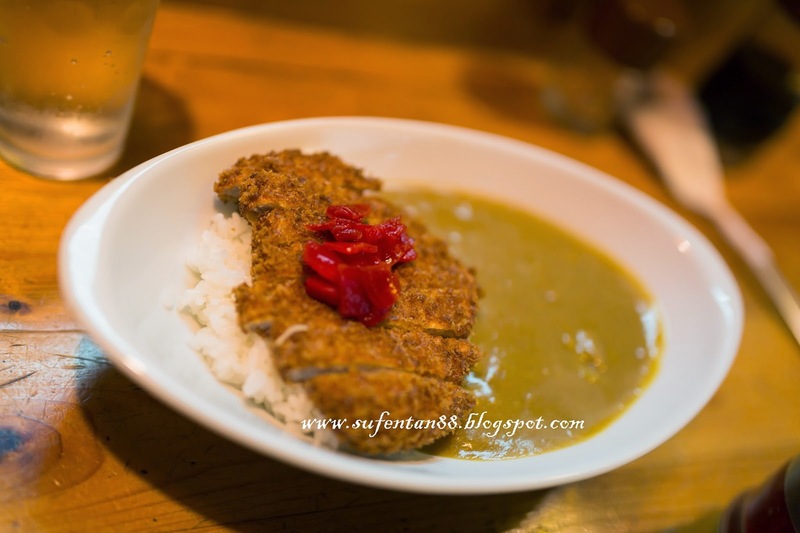 The spiciness of the curry is around 3/5, a bit spicy compare to normal Japanese curry. 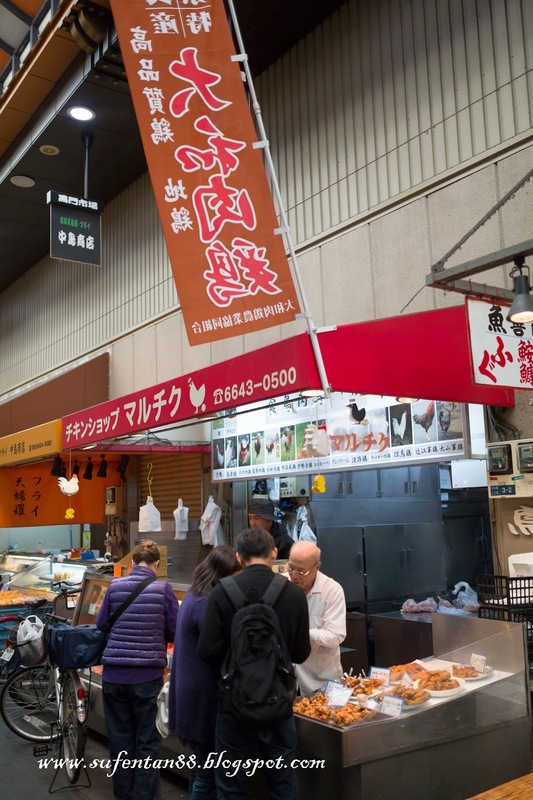 You just can't miss it when visit Kuromon market. The shop selling wide variety of chicken like free range chicken and ducks. They even sell ready to eat fried chicken. We bought the Karaage chicken that served in small pieces. I can't remember the price but it is not cheap. 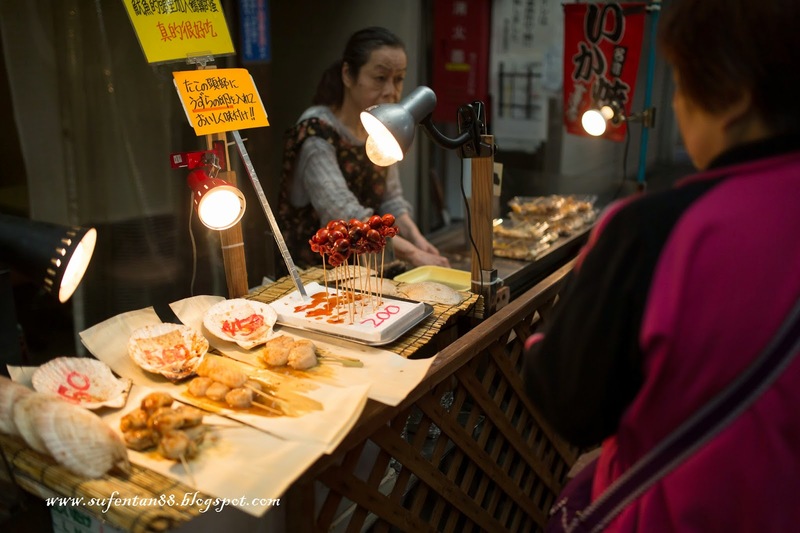 All fried chickens are sold by weight. 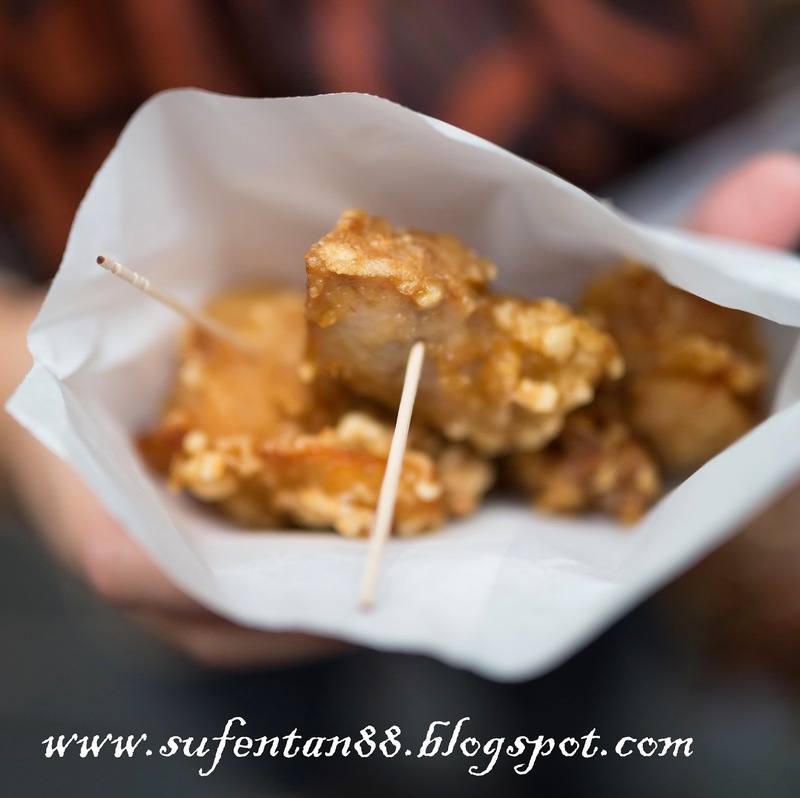 The karaage wasn't taste that nice as it is already cold and not crispy. Quite disappointed. 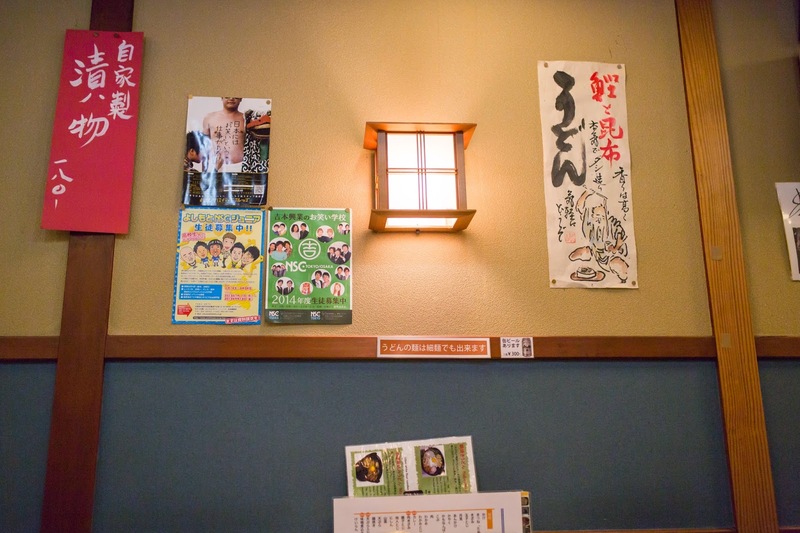 There isn't any English signboard to indicate the place, so I follow the guide map based on the number given and photo to track the place. 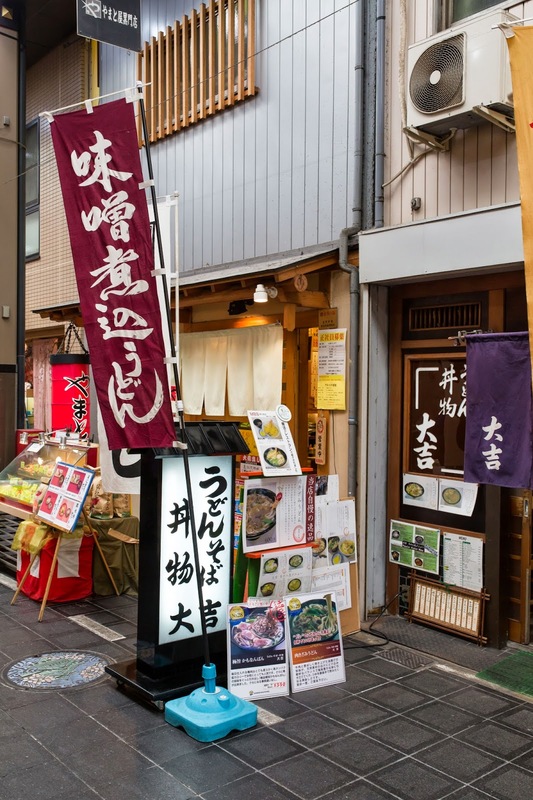 This shop famous for its Dashi (Japanese cooking broth). Since I was craving for udon, we went to tried out their food. Again, small shop operates by owners themselves. The place able to accommodate around 24-30 pax. Simple setting with wooden tables and chairs. 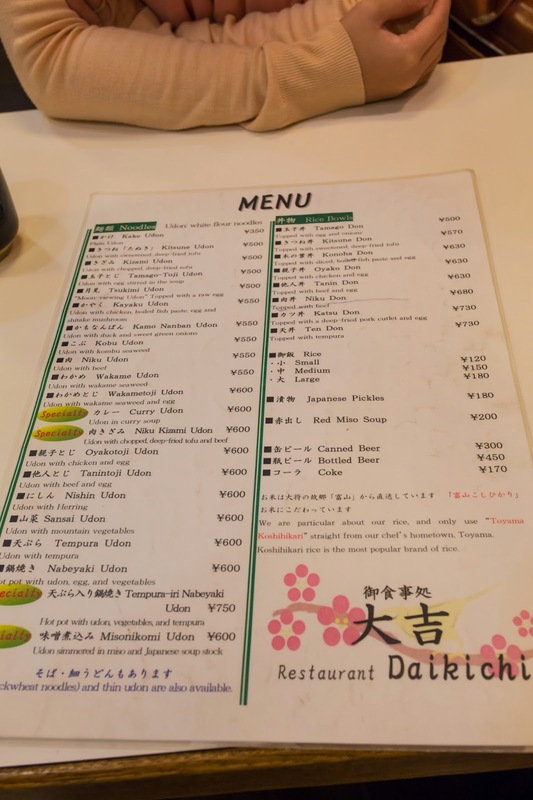 I think a lot of tourist visited the place, therefore English menu is provided. Finally, I am able to read the menu and pick my preferred item without him to translate for me! I ordered their tempura udon. I love their dashi, clear soup and tasty. 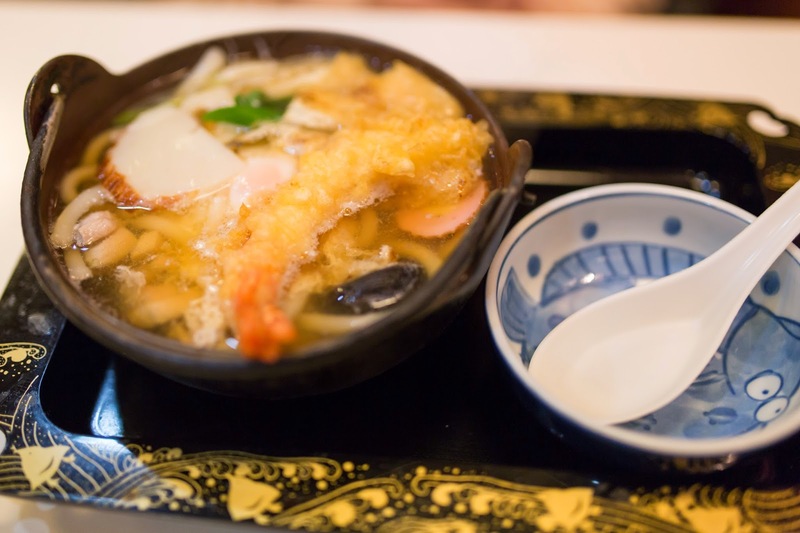 However, I still prefer the Omen's Udon in Kyoto. The best Udon so far though the price is high. 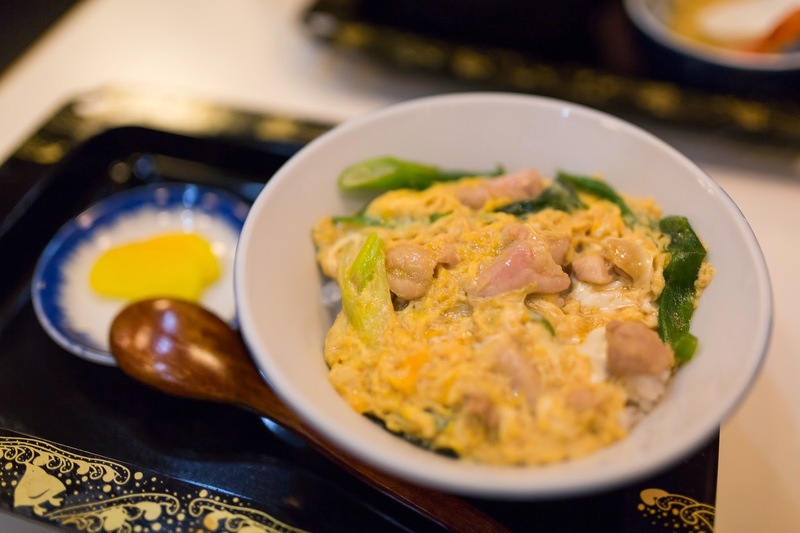 He ordered the chicken & egg rice since he is a fan of Japanese rice. He just love it and can't be bored about eating it every meal every day. Overall the taste is just so-so but the standard is much more better than a lot Japanese restaurants in Malaysia. We also bought some green tea from Yamaguchien Tea Shop. It is located at no. 7 in the guide map. The owner is a old man, very friendly guy. He introduced us the Sencha (premier green tea) and let us try out a few type of green tea. He even gave us a list of how to brew green tea based on the type of green tea available. I missed to take photo of his shop, too excited talking to him (oops, my guy who talk to him in Japanese not me..>.<). I will definitely visit him again!